EmiArteFlamenco is honored to present legendary dancer and choreographer Carmela Greco and guitarist Antonio Gabarri Jimenez, with Vicente Griego (cante), La Emi and Nevarez Encinias (baile), and special guests Flamenco Youth de Santa Fe. Doors open at 7 p.m., show begins at 8. Tickets $20–$40. 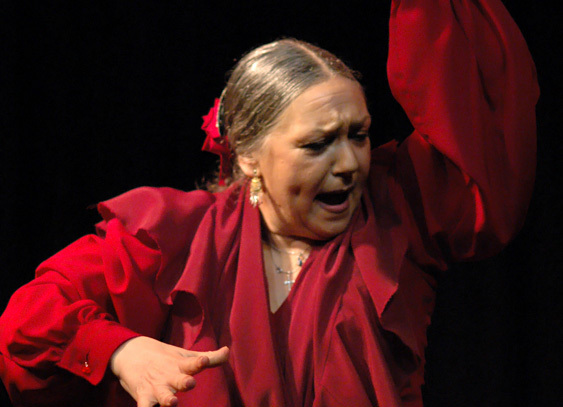 La Emi is the stage name for Emmy Grimm, a Flamenco artist based in Santa Fe who began her dancing career with Maria Benitez, and has made annual trips to Spain, where she was invited to live with Carmela Greco, daughter of the legendary Jose Greco, and a renowned dancer herself. The two are appearing on stage in Santa Fe for the first time. Carmela took a few minutes to answer some questions from culturevulture. >>> Q? Your father, Jose Greco, was a famous dancer and choreographer on stage and in the movies. You and your two sisters went on to become flamenco dancers. What was life growing up with your father, and what is it that you learned from Jose, that you pass on to young dancers like Emi today? * I learned a lot from my father, not only about dance, but about life. He left me with a very huge legacy. With dancers like Emi, who are interested in the dance and culture, it’s very easy to pass on all of my knowledge about technique and this art form. >>> Q? What will you be dancing tonight in Santa Fe? Can you tell us a little bit about your relationship to this palo? What does this dance say for you? *The Taranto is a palo that came from the mines. They are below the earth and are more profound than the root of a tree. In this form I feel comfortable to be express everything that I have lived through in which I couldn’t express in any other way with such profoundness. >>> Q? La Emi has been staying with you while she studies in Spain. What is your relationship like? What is it that you see in her as dancer? What advise do you have for her? * Emi is like my daughter. Since the first time she was came to Spain I adopted her as a daughter. Emi is a hard worker, and is perseverante who loves flamenco and loves learning just like me. I have given a lot of advice to Emi but for me one of the most important things that I learned from my father is before you are an artist you need to be a person and she is.